Exercise 2.2 – Stacey Page. Write 500 words on a piece of work by one contemporary artist – photographer, who uses the archive as a source material. Stacey Page is a mixed media artist from Georgia, USA. 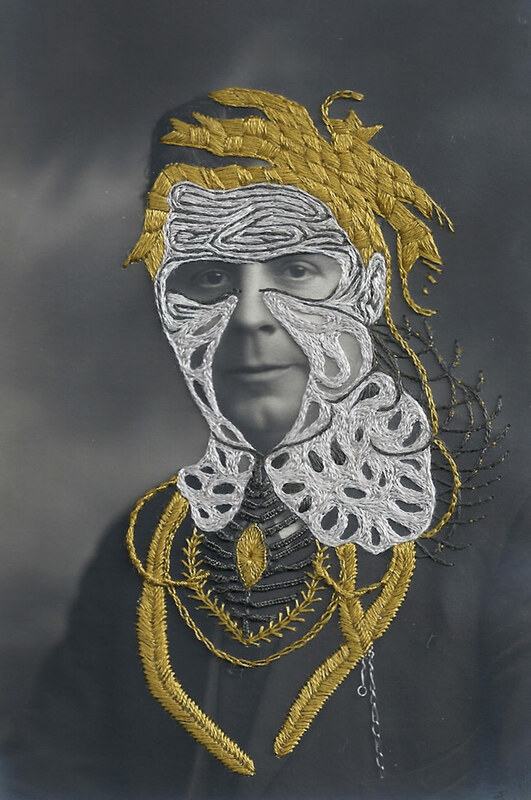 She’s previously worked with paint, clay and wood, however, in her most recent pieces, similarly to artist Julie Cockburn, she has settled on using found photographs with the addition of different coloured thread. Once she has chosen her desired photograph, deciding where to start and what design to hand stitch, can be a tough decision. Page often spends a lot of time staring at the photograph throughout the whole process, enabling a relationship and a bond to develop between them. She uses paper to sketch different designs, playing around with different colours and types of stitches that may work. 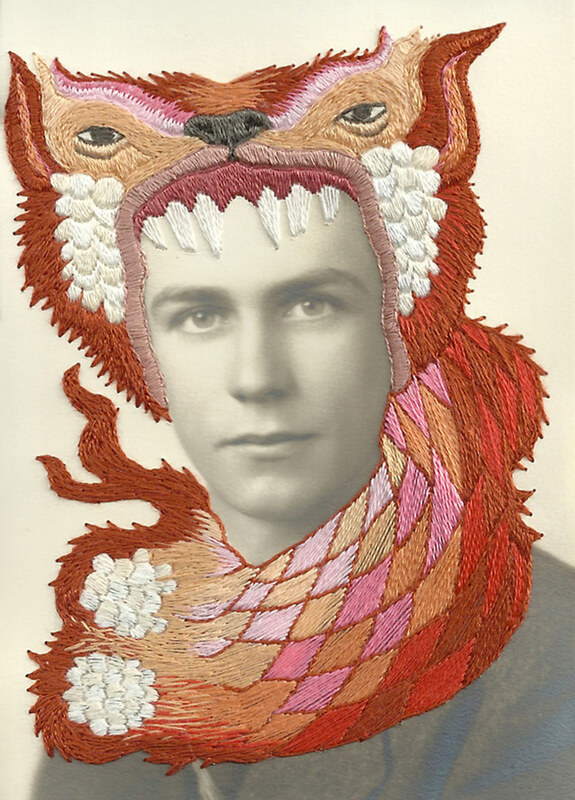 Taking inspiration from the ‘obscure and bizarre backwoods of Georgia’, where many of these photographs were found, her final pieces tend to focus around an obscure fantasy theme with mythical creatures. 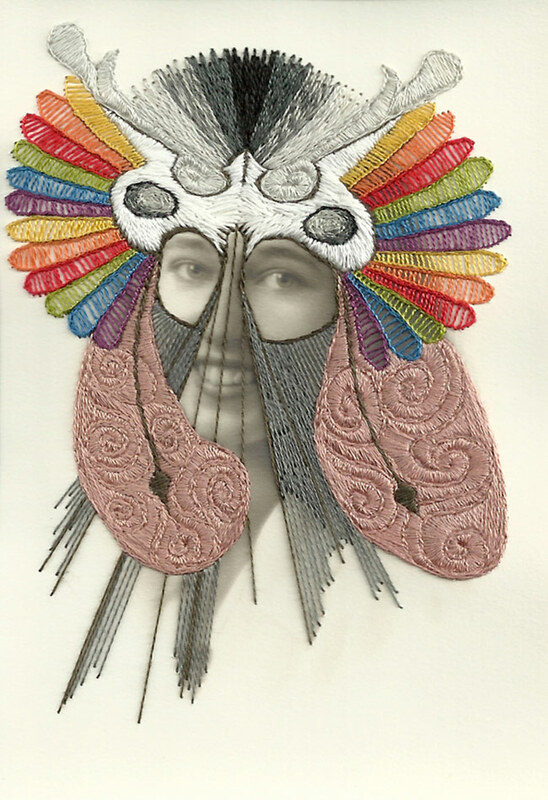 These creatures are then hand stitched onto or around the subject, like a mask, headdress or an aura, flowing from inside and around their being. Coming up with unique, and different designs for each photograph can be challenging, and depending on the size and type of photograph, her relationship with it can become strained and frustrated, causing her to sometimes loose her momentum with her inspiration and the photograph all together, thus meaning that she prefers to work on smaller scale photographs, as they are more convenient and rewarding in the end, whereas larger photographs are more time consuming. However, she does continue to experiment with the larger sizes now and then. I really admire Julie Cockburn’s hand embroidered work, however they seem to be all the same, for example all circles or geometric designs. In a way, I prefer Page’s work more than Cockburn’s as each one is unique and intriguing to look at. Page creates beautiful, textured and colourful pieces of art, and you can see from how detailed and precise her pieces are, just how much time and work she puts into each piece. I can see and feel more character and ‘life’ in Page’s pieces when I look at them, more so than those by Cockburn. Despite these photographs being old, discarded, inanimate objects, which had no future, I believe Page somehow manages to breath a new life into each one, giving them each their own individual character and story. Although she mentions that she does fall out with some of these pieces when she is creating them, I can’t help but think that she does really care about them and slowly becomes attached to them, which is why her relationship with them can become frustrating. After all, she does name them. 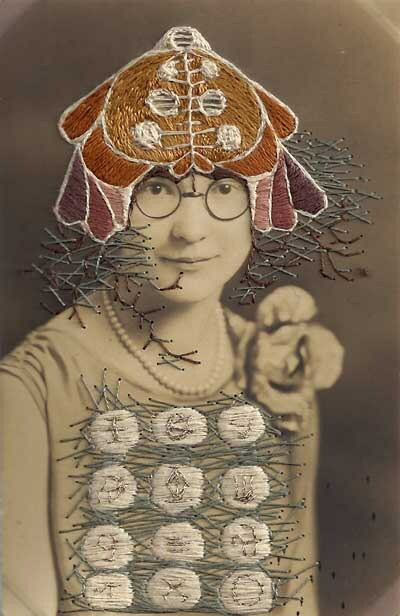 I really admire her work, and find the use of thread as a medium very interesting. I had not seen this type of work done before, until I researched Julie Cockburn, so finding Page’s work for me was a new experience. I would love to try and make a piece similar to these pieces of art, however, I honestly wouldn’t know where to begin. 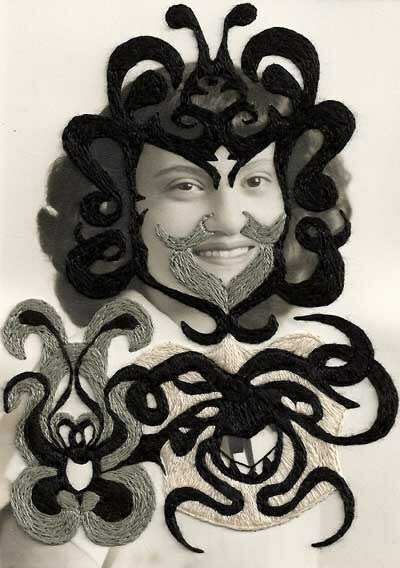 I have no experience using fine needles and thread on old photographs, however, it is something I am willing to try. [1 – 5] Quotes taken directly from interviews with Stacey Page, from the websites below. 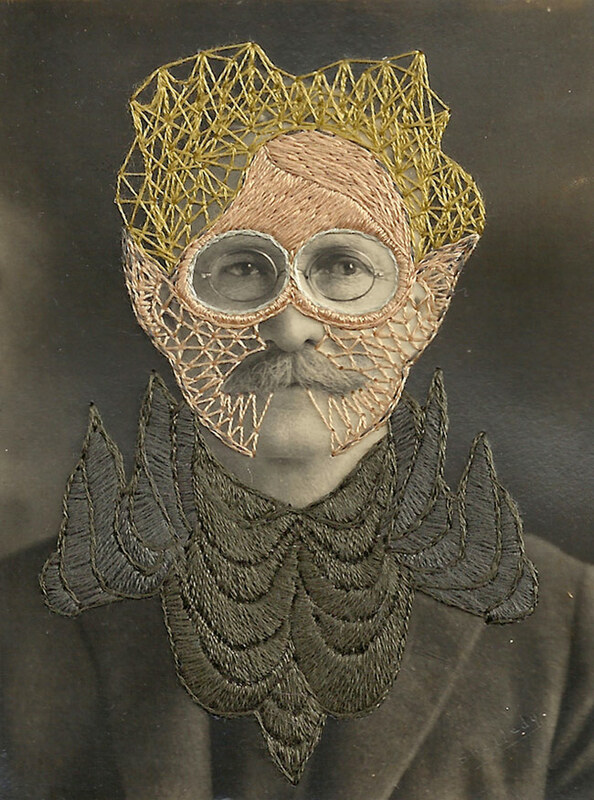 Stacey Page artist interview: Using thread to explore ego & avatar. 24/05/2012, by Tessa Hulls. Next Article Exercise 2.2 – Jane Long.